Miles Rogoish is not a stranger to the BMX world. Most people know that he is as talented in front of the camera as he is behind it. His videos capture the raw energy of BMX and allow the viewer to see into a session through an unedited window. After watching the Stranger Mixtape a few times I decided to hit up Miles and find out what goes into his filming and editing process. You’ve been in the filming game for a long time, how long was it before you really felt like you hit your stride with your film work? I’ve been filming for almost as long as I have been riding, I really caught the first stride during the beginning of the TWM (Tuesdays With Miles) series. Once I was laying footage to music and color correcting once a week besides the other projects I was working on it started to be a steady routine. Now I have the same stride but it just gets better everyday, except for my OCD making me nuts since I have a checklist of about 10 things I have to make sure are just right after actually editing the piece. Shits hectic these days between my Mac screen and the inside of my brain. What’s your current filming gear set up? 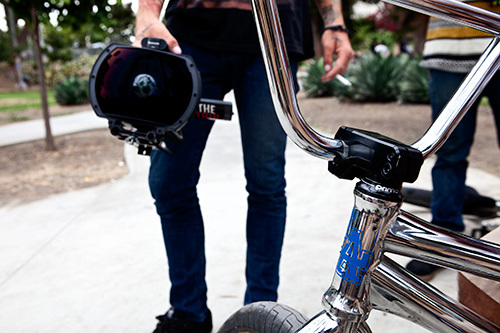 And I am currently looking at grabbing a Cannon 7D DSLR set up for filming mediums outside of BMX. FAWK, Get it done I guess? I have more projects unfinished on my computer now than I have ever had. Guess it really depends on the project. If it’s a long term project it’s not ready till it is. If its a quick content piece then I import, lay down the preferred timeline by trick difficulty, watch it with the sound off to random music, pick a track, chop it up, ramp slo, color correct, audio adjustment, titles, and export! I love the feeling of a piece being complete and dialed from start to finish, even the fades come in and end on beats, nothing just gets set down and is “fine” it has to be perfectly on point for me to be able to move to the next. What’s your best advice for filming lines? Get on a skateboard with big soft quiet wheels and if you hit a crack grab that mother fucker like its your own child. A lens blemish can put filming on old for as long as it takes century to replace the front element. Also get UP IN THERE! Don’t be scared to get up and close with the crunchiness, the closer you are without chopping heads and wheels is the prime distance to be from the rider the whole time you are filming a “line”. What filmers in the game do you look up to? BMX Filmers – Tony Ennis, Tony Malouf, Will Stroud, Ryan Navazio, and Ty Morrow actually kills the film game, plus a small handful of the homies know what it is to get crunchy. Filming for the Stranger Mix, was it nice to get back on that VX kick? The editing for the new Stranger Mix was done really well. Could you just share a little about what went into it and how you approached the project? Any advice for the up and coming filmers out there? Just go shoot and be inspired by everything you see. Instead of bitching about VX vs. HD or tripod vs. skateboard or anything you think you can complain about just focus that energy on creating something new for someone else to rant about. You’ll stay happy and your video work will keep improving. Never compete against anyone but yourself.